We’ve made it through eight weeks. That’s like half of Boot Camp. I went into Boot Camp right around this time in 1971 – 47 years ago. I don’t remember it being this tough, however. I’m sure that it has nothing to do with selective memory and the very simple fact that I was a mere 19 years old at the time. Invincible youth and all that… The ensuing 47 years have been a roller coaster of being bad and being good – more bad than good. I’m paying for it, today. The gym is getting easier and harder. It surprises me how something that looks as if it should be fairly easy ends up killing me, while I’m able to get through things that I’m sure should kill me. Our Trainer has gotten to know us really well and is pushing more and more. Today, I took 2 aspirin when I got home. Ouch. And just because I’m jonesin’ for some good bread, I’m going to bake some sourdough tomorrow. I’ve been working on the starter and the leaven for the past 10 days! One of those loaves will end up in the freezer, as well. I still plan on losing two pounds next week! 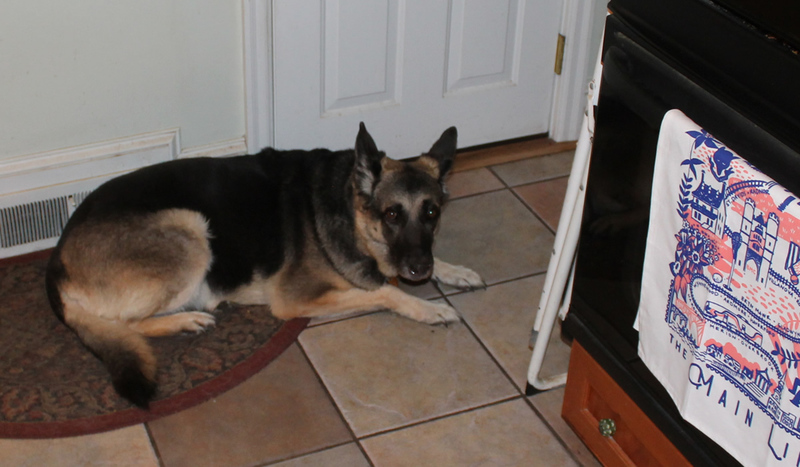 And… here’s Blanche keeping me company in the kitchen while I’m cooking.